In peripheral port markets, a limited volume of traffic creates challenges in sustaining multiple competing port authorities (PAs). With a limited size, smaller ports have difficulty in attracting the necessary traffic flows to leverage capital for development. In many European jurisdictions, recent policy reform has sought to concentrate resources in dominant ports or amalgamate smaller PAs to increase competitiveness and rationalise investments. 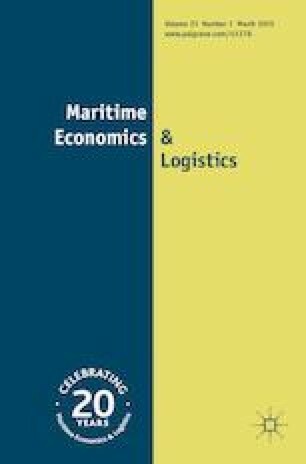 This paper formally examines the link between port size and achievable efficiencies through an efficiency analysis of Irish and Atlantic Spanish ports. To achieve this, the paper applies a two-step, double-bootstrap data envelopment analysis (DEA) approach to examine the effect of relative size on technical efficiency across the two port systems during the period 2000–2015. The results indicate a positive relationship between size and technical efficiency amongst ports in peripheral regions. As the time period covers the last global financial crisis, it is possible to further explore the effect of the recession and subsequent contraction in the market for port services on the relationship between size and technical efficiency. The findings indicate that the effect of size on technical efficiency becomes even stronger when market contraction is accounted for. Results also show that the efficiency gap between the larger and smaller ports increased considerably after the recession. This research was carried out with the support of the Marine Institute and funded under the Marine Research Programme of the Irish Government (Grant-Aid Agreement No. PBA/SE/16/01). The authors would like to acknowledge the constructive comments provided by two anonymous reviewers on an earlier version of this paper. Drichoutis, A. 2011. Interpreting interaction terms in linear and non-linear models: A cautionary tale. https://mpra.ub.uni-muenchen.de/33251/. Accessed 11 Oct 2018. National Ports Policy|DTTAS Department of Transport, Tourism And Sport. 2013. http://www.dttas.ie/maritime/english/national-ports-policy-0. Accessed 21 Oct 2018.